For at least a decade, movie years in the US have been defined not just by the stream of pre-ordained event releases, but also by the search for the next "indie" hit, which is to say, a "small" film that earns its theatrical distribution through the festival circuit and then breaks out for critics and audiences alike. There's not much question that Little Miss Sunshine was the clear winner of the 2006 indie hit sweepstakes, but, as indicated by award nominations and critics lists, including PopMatters' selections for the Best Film of 2006, Anna Boden and Ryan Fleck's darker Half Nelson was regarded very highly, too. Given its subject -- a drug-addicted teacher, Ryan Gosling's Dan Dunne, and his struggles with both his own demons and those of one of his students, Drey (Shareeka Epps) -- Half Nelson's success is certainly more surprising than that of the warmer, and more star-blessed, Little Miss Sunshine. Convincingly acted and lovingly shot, Half Nelson is also distinguished by its thoughtful interrogation of American audiences' inherited images of inspirational teachers. The DVD release offers a quality transfer, a commentary track from co-writers Boden and Fleck, who is also the director, and supplemental materials, including deleted and extended scenes, the video for Rhymefest's "Wanted", and outtakes. As it begins, the movie drops the audience into Dan's life early on a school day, but this is a day set somewhere in the middle of his life. From there, viewers quickly learn about the primary poles of his character: the classroom, where he teaches historical dialectics in lieu of the standard curriculum, and drugs, particularly cocaine. Through an encounter with a former girlfriend, Rachel (Tina Holmes), it is revealed that Dan has tried and given up on treatment and rehabilitation. He insists, repeatedly and to different people, strangers and friends alike, that, "The kids keep me focused." Dan sees teaching as his way to make a positive difference in the world. "Teacher" is the dialectical opposite of his "junky" self. Fleck and Boden also stay true to the idea of dialectics in representing Dan's character as the product of the tension between "teacher" and "addict", rather than making one or the other his single true self. Indeed, looking at the self as both "good and bad", "straight and crooked" is the subject of one of Dan's more rambling lectures to his class. Lurking in the background of Half Nelson, and the mind of Dan, are other silver screen teachers, characters like Sidney Poitier's Mark Thackeray in To Sir, with Love (1967), and Robin Williams' John Keating in Dead Poets Society (1989); both who made a difference by inspiring their students to transcend the limits of their formal educations and immediate environments. In the case o f Half Nelson, Dan zeros in on quiet, but seemingly bright and at-risk, Drey. Even though she seems, student-wise, in the middle -- that is, less bewildered and bored than some, but not as intrigued and as enlivened as others -- when it comes to Dan's historical dialectics, she sees in him the possibility of an adult presence that is otherwise absent in her life. Drey has an older brother, Mike (Collins Pennie) who is in prison and a mother, Karen (Karen Chilton), who works long hours as an EMT). The student-teacher relationship takes a turn when Drey discovers Dan high, crack pipe in hand, in the locker room after a basketball game (Dan coaches the girls team). This revelation simultaneously introduces a distance between them -- he isn't quite who she thought he was – while also making it easier for them to relate to each other outside of school. Dan's drug use somehow makes him more 'human' and approachable to Drey. Eventually Frank (Anthony Mackie), a drug-dealer and close associate of Mike's, enters the picture. Like Dan, Frank feels compelled to look out for Drey. This is at least in part due to an obligation he feels towards Mike, who, it is implied, is doing time alone for a crime that he and Frank could easily be paying for together. Dan and Frank become rivals fighting for Drey's future. This introduces another dialectical opposition to the narrative, and much like Dan "the teacher" and Dan "the addict", they form not mutually exclusive alternatives, but are instead both parts of a larger whole. They are suspicious of each other for their respective roles in the drug trade. They are both interested in Drey, although mostly for reasons that have more to do with themselves than with her. Both end up having an impact on her life, but not necessarily in ways that they intend or control. In Dan's case, his relationship with Drey become redemptive, not so much because it validates his contribution to the world, "to change one person", but because she takes an interest in saving him. The central irony of Dan's failure to fulfill the ideal of the inspirational teacher through Drey is that he does, in fact, change individual students with his approach to history. Stacey and Gina (uncredited characters), Dan's most engaged students, are visibly upset when it appears that he won't be returning to the classroom. In another scene, the father of a former student approaches Dan in a bar to tell him about how his kid is now a history major at Georgetown. Dan, whether due to drunkenness or simple lack of recall, struggles to place names and faces without success. 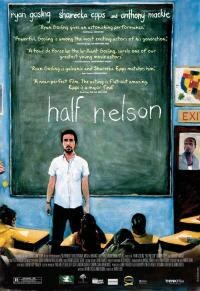 In this way, Half Nelson seems to validate what teachers actually do, that is, teach, rather than perpetuate the idea of the exceptional teacher who lifts his students up more due to his magical personality than his skill and thoughtfulness in the classroom (consider how often the subjects of films such as this are "accidental" teachers and not ones who set out to make teaching their profession). Viewing Half Nelson for the second time, at home on DVD, I found myself more drawn to Drey and Frank than I did in the theater. On first viewing, Dan and Ryan Gosling demanded most of my attention. Dan's character and performance are bigger and more cinematic than the other two, and he dominates the screen. Shareeka Epps and Drey benefit from repeated viewing and the smaller scale of television. In the theater, her quietness and observational approach to life came across as passive. On second look, she appears more calculating, especially in close-up where it's easier to see the gears turning behind her eyes. This also enhances the significance of her interactions with Frank. In the theater, his character seemed more like a complication and less like a serious opposing force. This time, Frank appeared more as an equal alternative for Drey to negotiate. As with Shareeka Epps' active intelligence, the sincerity of Anthony Mackie's performance also came through more clearly on second viewing. The concern in his face when he confronts Drey about Dan's addiction suggests that warning her off of him is more than a strategic ploy; it also reflects genuine concern. Half Nelson communicates much about its characters and the worlds they inhabit through mise-en-scène. Dan's small, spare, but still sloppy apartment suggests not just his low pay as a teacher in an inner-city public school, but also someone who tries to keep himself together through simplification rather than actual upkeep. His casual, vaguely stylish, but decidedly off the rack clothes similarly befit someone striving to be the hip teacher. The neighborhood landscapes of the film are filled with old apartment buildings, modest houses, and concrete parks. The school is antiquated, but not falling apart. It is a part of the city that is neither gentrifying nor in complete decline. It is one where Drey's mom and Frank co-exist uneasily, another set of opposites that make a whole. On television, these details are less apparent. On the other hand, as suggested above, the people in the film come across more strongly. The hand held camera is also more obvious on the smaller screen, but, as in the theater, the shakiness of some images matches Dan's tenuous hold on life and conveys an impression to the viewer of actively looking in on something real and immediate. What isn't affected by the shift to small screen viewing of Half Nelson is Anna Boden's editing, which favors narrative gaps over full exposition. In one key moment, or "turning point" as Dan likes to call them, Dan drives to Frank's house with the intent of forcing the other man away from Drey. He sputters about thinking that he's "supposed to do something", but obviously isn't sure what. Once Frank gets him to calm down, they retire to his house. The next time we see Dan, it is night and he is driving in his car, looking a little worse for wear. What transpired in that house can only be inferred from subsequent events. Did they reach an understanding? Did Dan pack it in? Did they share their concern for Drey? We don't know. An alternate version of this scene included on the DVD doesn't take you into the house for their presumptive sit down, but it does include some friendly banter that would have suggested a positive reading of what transpired between them. The more ambiguous conclusion that ended up in the film opens up a richer set of possibilities and asks audiences to think through the aftermath rather than simply moving onto the next scene. Other deleted and extended scenes on the DVD also illustrate the kinds of editing choices made by Boden and imply a philosophy of showing rather than telling and of letting ambiguities stand rather than feeling compelled to clear everything up. The film-to-digital transfer is generally of high quality, with the only major flaw being in low light conditions where bright spots and highlights tend to pixelate or blow out. The transfer also seems to accentuate the film grain, but, like the shakiness of the camera, this primarily serves to accentuate the naturalism of Andrij Parekh's cinematography. Boden and Fleck's commentary track sheds light onto the creative process of the film, addressing both the editing and the photography, as well Boden's work as a producer, the script, and interactions with the actors. There are, of course, the requisite expressions of admiration for the people they collaborated with, but on the whole they stay focused on matters of substance (you also get an explanation of the title; and, yes, it does have something to do with the wrestling move). It is well worth a listen, especially for anyone interested in independent film making. Modest indie breakouts like Half Nelson often do well on DVD as more casual, but informed moviegoers get caught up on titles they missed in the theater. In this case, they will be rewarded with one of the best films of last year and a DVD that provides its fans and admirers with the kinds of extras audiences have come to expect in the home versions of notable films.